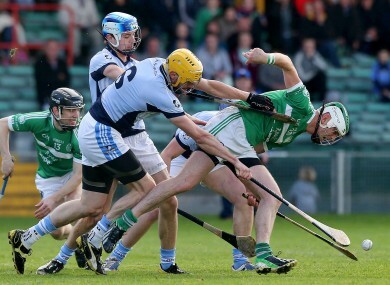 Kilmallock and Na Piarsaigh faced off today. THERE’LL BE NEW Limerick and Munster senior club hurling champions this year after Kilmallock were defeated at the county semi-final stage today by Na Piarsaigh at the Gaelic Grounds. Na Piarsaigh, Munster club champions themselves in 2011 and 2013, clinched a 0-20 to 2-13 win over a Kilmallock side that had contested the All-Ireland club final last St Patrick’s Day. At the break Na Piarsaigh were in front 0-12 to 0-7 with Peter Casey impressing in the scoring stakes for them and Jake Mulcahy doing likewise for Kilmallock. Early in the second-half Kilmallock got a boost when Robbie Egan found the net to leave them trailing 0-13 to 1-8. But Na Piarsaigh upped the ante once more to be ahead 0-19 to 1-10 with ten minutes left and in possession of a four-point lead entraining injury-time. Kilmallock grabbed a late goal to ensure a nervy finish for Na Piarsaigh but they hung on for a narrow one-point success. In the final Na Piarsaigh will take on Adare or Patrickswell who meet in the other semi-final after Adare came through today’s quarter-final replay again Ahane by 1-20 to 2-10. A John Fox goal gave Ahane an ideal start but then Adare took over with Willie Griffin in good point-scoring form and they lead 0-13 to 1-3 at the break. Mikey Mackey found the net to send Adare into a 1-16 to 1-4 lead early in the second-half and despite an Ahane rally, it was Adare who ran out six-point victors. Email “There'll be new Limerick and Munster senior club hurling champions this year”. Feedback on “There'll be new Limerick and Munster senior club hurling champions this year”.